The first step in the new story of the masts site throws open its doors today, Saturday. The Tuning Fork eatery is open to all, offering a striking new place to go to eat or for a coffee. 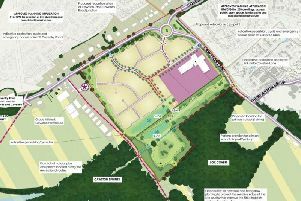 It is part of the revamped Dollman Farm complex and will start to get the message out that Houlton, the name for the development, is truly on its way. It will be open seven days a week, Monday-Friday from 7.30am-4pm, Saturday from 9.30am-4pm and Sunday from 10am-4pm. Elaine Enticott, owner of Chef’s Kitchen at Hillmorton which is running it, said: “We have worked together with Urban&Civic to create a unique eatery in what will eventually be a new and beautiful place to live. “The building has been custom-made and individually designed for us and we have strived to create a very individual place to and eat and drink. The Advertiser was invited to a Supper Club preview evening last Thursday.